Hands up who *doesn't* like Indian food? Yup, just as I thought, I have to squint to see those few and far between hands. Indulging in some buttery naan, crisp poppadums, spicy atchars and creamy curries is my idea of a pretty perfect evening. Add good company in the form of TheHusband (or perhaps some Big Bang Theory) and you're set. Of course in the summer months one doesn't necessarily feel like whipping up a heavy or creamy curry. Or eating it for that matter. Which is why this delightful recipe immediately caught my eye. It appealed to my craving for Indian flavours, but, even better, it appealed to my need to prepare a meal in less than half an hour. And, after all, that's the holy grail, isn't it? Indian Pork with Pickling Spices is unusual both in that it uses pork (not an oft-used ingredient in Indian cuisine) and also in the speed with which it comes together. It's basically an Indian-style stirfry with some pickles and chutney thrown in for good measure. There. How's that for demystifying home cooking? PS: If you haven't tried it before, and you can get your hands on a bottle of Indian lime pickles (I use Patak's brand), please do yourself a favour and and give it a whiff. That alone will convince you of the wonders that lie inside that bottle. Although I have to warn you, you might be tempted to dive into the bottle with a spoon. I encourage you to practise restraint. At least when there's people around. Rather take the sensible route and keep the bottle in the fridge for making multiple batches of this pork. Because I can guarantee you that one serving won't be enough to satisfy your citrus-addicted tastebuds. Meena suggests serving this with basmati rice and lentils, but I prefer the somewhat sticky texture of jasmine rice for this particular recipe. I usually saute some babymarrows or broccoli to serve alongside the pork. 1. Heat oil in a large saucepan over high heat and add the garlic and ginger. Fry for a few seconds, then add pork and cook for another 3 - 4 minutes, stirring frequently. Lower heat and cook for another 5 minutes. 2. 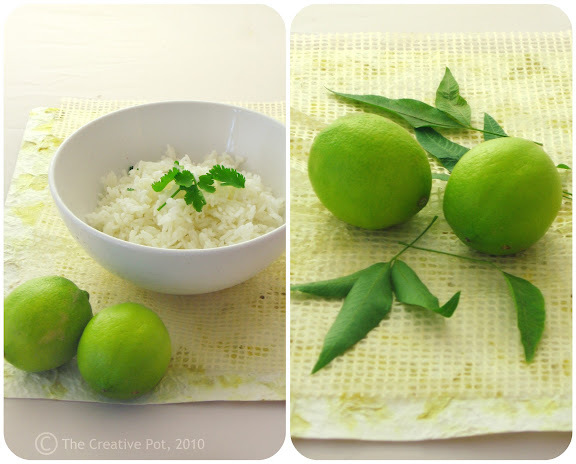 Add lime pickle and chutney, cover with lid and allow to cook for 5 minutes to infuse the flavours. 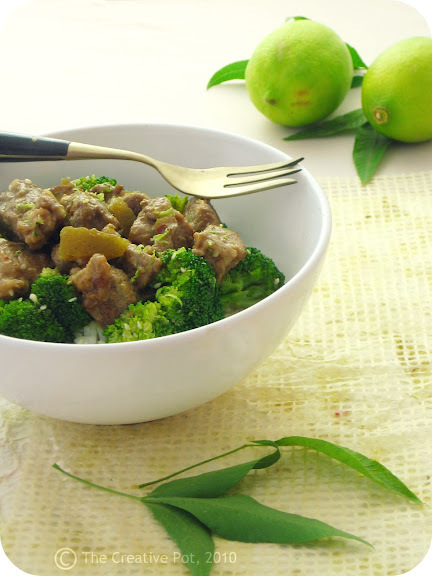 If you are unable to find lime pickle in your local grocery store or Asian supermarket, About.com has a great recipe that you can try out. Hmmm - this dish looks absolutely perfect. I'm in love with all the different flavors here. You are fast becoming a foodie of the world!!! I love it!! Yummy yummy yummy! 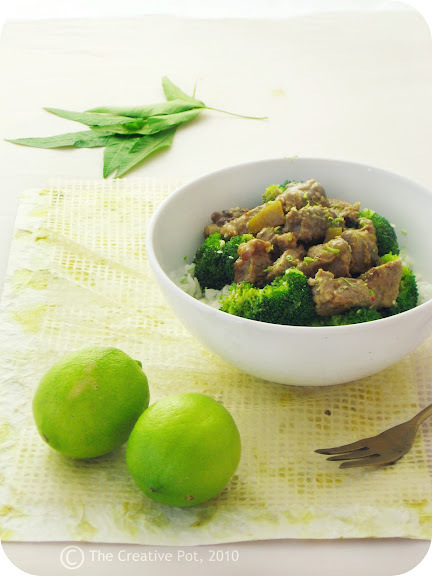 Broccoli is a winner...this pork looks delicious! I have never even heard of lime pickles but I might have to go on a hunt after reading your recipe! This looks easy to make, and fantastic. Great pictures, by the way! Indian food is one of my absolute favorite cuisines (along with Thai) but I don't make it often enough. Hmm Indian lime pickles? I've never had them before. This looks delicious! Righty ho, now I know what's for supper tonight!